Philippa Quinn in Square Rounds. Images SR Taylor Photography. 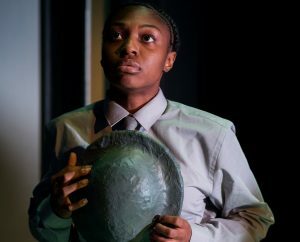 It’s been 26 years since Tony Harrison’s anti-war polemic, Square Rounds baffled and amused audiences and it has lost none of its bite. The original National Theatre crowd may have been bemused by this odd performance piece, that lectures against weapons of mass destruction and war in general. 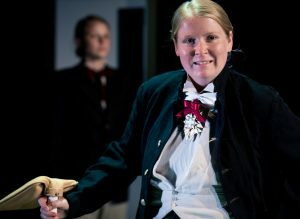 But it hasn’t put off all-female theatre company Proud Haddock reviving it for a run at London’s intimate and innovative Finborough Theatre. I say odd because Square Rounds is as strange as its title. It’s not exactly a theatrical production but more a series of skits, in poetry and prose, about long forgotten and (to me) completely unknown boffins who traded naivety for death on a massive scale during WWI. My poor upbringing didn’t stretch to learning about Justus von Liebig, William Crookes, brothers Hiram and Hudson Maxim, and Fritz Haber. But I’m sure they will mean something to history and science buffs, and particularly those who have studied military history. For these men decided the winners and losers on the Front Line by investing their energy and knowledge in the mystical properties of..let’s be polite…human waste. These utterly brilliant inventors, mostly Jewish, ignored the appalling treatment of their race by Germany, to create what they thought would be the farmer’s friend, nitrogen-based fertiliser, to boost crops and feed the world. Instead it was used to make TNT – Trinitrotoluene – to be packed into bombs. And, amazingly, rather than be appalled at its misuse, they deluded themselves that lives would be saved with their weapons by bringing about a rapid end to war. As we all now know, it just led to worst weapons being invented and an escalation of fighting. These bright types never learn. Square Rounds is superbly acted by an ensemble of six but the cast are let down by the uneven script which isn’t as darkly funny as it could be. It’s almost a satire, it’s certainly thought-provoking, but at times it resembles an Ed-Fringe farce, the banter raising a mild guffaw rather than a chuckle. 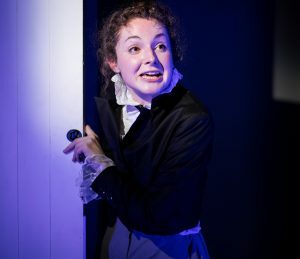 There’s a fart gag, which smacks of desperation, and a loo – sorry – water closet, used as a strange time travelling Tardis to bring back the inventors to explain themselves before a modern audience. There is also an overall feeling of being lectured to, that I’m sitting in a university theatre being taught the history of biological warfare circa 1914-18, rather than at a theatrical production. It’s occasionally rather preachy in pushing its pacifism and anti-war message. There’s no doubting its terrifying core themes. There are moments that chill to the bone when the chemists are overcome with gleeful enthusiasm at being responsible for wiping out whole armies with machine guns, gas and bombs. Does it add anything to the production that women are playing the roles of men? No, not really but they are all very good. 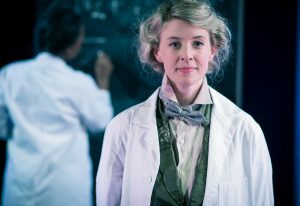 Philippa Quinn’s performance stands out as buoyant Nobel Prizewinner, Fritz Haber. He’s a tad too Willy Wonka, in the top hat and flashy waistcoat, but she pulls off his eccentricity, in both behaviour and demeanour, with a potent performance that becomes more horrifying with every boast he/she makes. And Letty Thomas makes an engaging narrator, the voice of the common man, plus a jovial Sir Hiram Maxim, a man who coupled inventing a machine gun with inventing an inhaler for asthmatics. A theatrical oddity, quirky and fiercely political, which teaches and entertains in equal measure. Square Rounds runs at the Finborough Theatre until September 29. 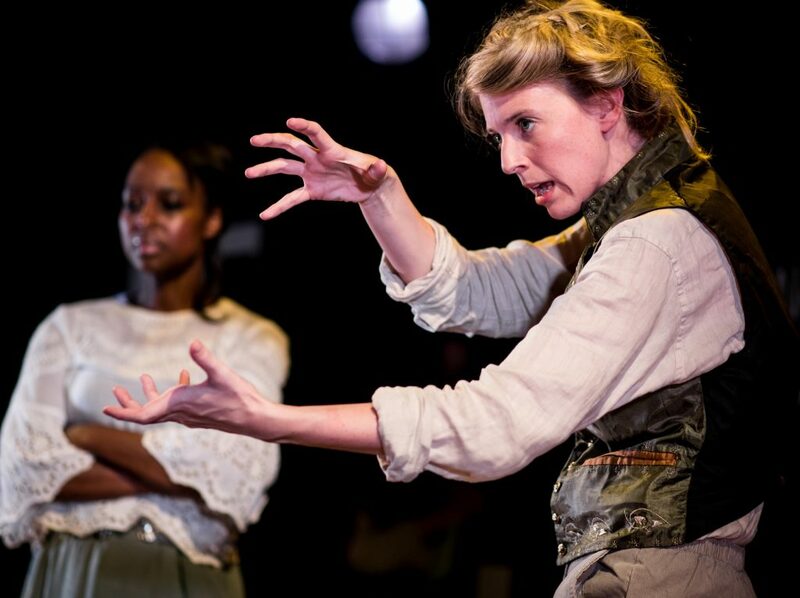 Tony Harrison’s fierce and quirky anti-war theatre piece, Square Rounds, chills with its gleeful lecture about history’s weapons’ inventors.